During the colder months, energy bills are on everyone’s minds as we begin to notice our homes becoming older. The average UK household spends £1,230 a year on energy, 50% of which may be wasted. 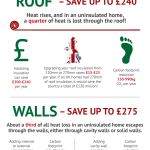 This new infographic from Cast Fireplaces gives some useful advice on how to stay warm without spending a fortune this winter.